Need a simple dessert for a special dinner? This rustic Cherry and Almond Cream Crostata is easy, but unique enough to be the special finale to a lovely dinner. So, inquiring minds want to know…what the heck is a ‘crostata' anyway? And how is a crostata different from a pie, tart or galette for that matter? So, if you really didn't want to know, then skip the next couple of paragraph and go straight to the good stuff. BUT…if you are the wee bit curious, then here's the scoop. A crostata; which is basically the same thing as a galette, just one (the crostata) originated in Italy while the other (galette) has it's roots in France, is what I think of as a lazy person's pie. And let me say right up front, I am all in favor of ‘lazy people's' things. 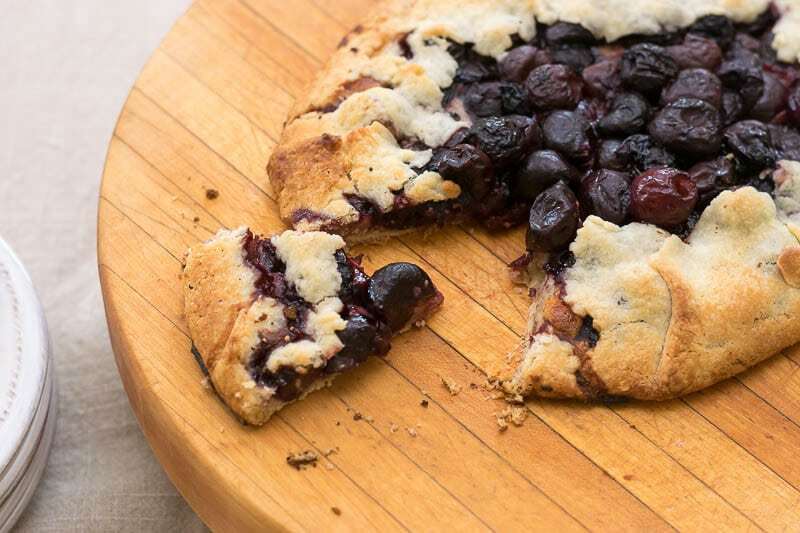 It's what you make when you have a bunch of apples or blueberries or cherries that need to be used up, and you can't get a vision of an apple or blueberry or cherry pie out of your head but just don't have the time (or gumption) to labor over a pie crust. It's more of a free-form or rustic pie…with the filling being in the middle of the crust dough and then the sides of the crust dough just folded over to hold all the yumminess in place. So with that heavy discussion out of the way, let's just dive into this Cherry and Almond Creme Crostata. 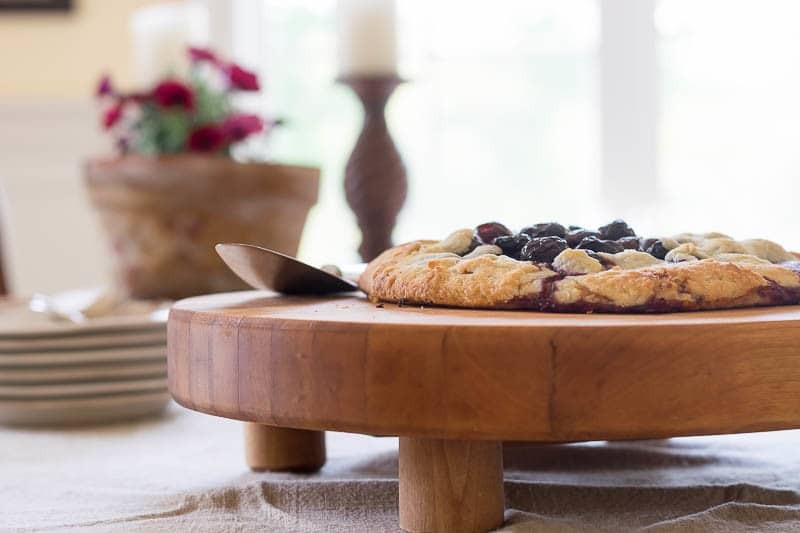 A rustic crostata (or galette) featuring cherries and almond cream. Place flour, sugar and salt in the bowl of your food processor. With motor running, add ice water all at one time through the feed tube. Remove from food processor and pour onto wax paper. Form dough into a round and wrap in wax paper and refrigerate for at least one hour. Add almonds and powdered sugar to bowl of food processor and process until the consistency of cornmeal. Add butter, vanilla and Amaretto or almond extract and process until a thick pudding consistency. Add egg and process until creamy. Put chilled crostata dough on a piece of parchment paper on your baking sheet. Pour almond cream into the middle of the dough, leaving about 2" of dough around the perimeter. Let cool and serve warm or at room temperature. By rolling the dough on parchment paper, you will not have to move it…which is a good thing as it won't move easily given how soft the dough gets. I used slivered almonds that were not blanched, so my almond cream had little flecks of the brown skin in it. If you would like to avoid the brown bits, use blanched almonds. This Cherry and Almond Cream Crostata is not overly sweet…just a lovely after dinner treat. I used frozen cherries, but I imagine fresh cherries would be outstanding. Want to add Cherry and Almond Cream Crostata to your dessert repertoire? Then bookmark this page or pin in for your future reference. Figured you’d appreciate that pastry humor!!! Have a great day my friend. Made your crostata yesterday, did not have cherries but did use pears and cranberries (plus some lemon juice and zest). They were pure heaven with the almond paste. Just perfect! !